First off, I hope you will bear with me as I figure out the best way to take pics of my recipes, and then get them to post in a better size for you. I promise, the presentation will only get better as I get more experience at all of this techy stuff! I can promise you this. This recipe tastes absolutely delicious. Trust me. But most important it’s so simple; you can’t believe it. I made it several times this summer for my son when he came home for his sister’s wedding. The first time I made it, he devoured it. Well, actually he devoured it every time we made it! Since becoming Vegan, he loves to cook! and did so a lot his last year at college. He loved this recipe because it was not only tasty but it also only called for a few ingredients and could be made with fresh or frozen veggies, which is always handy. In the book Eat to Live, Dr. Joel Fuhrman recommends eating onions and mushrooms every day. He also suggests eating beans and getting plenty of greens as well as healthy whole grains. I think this recipe captures it all. 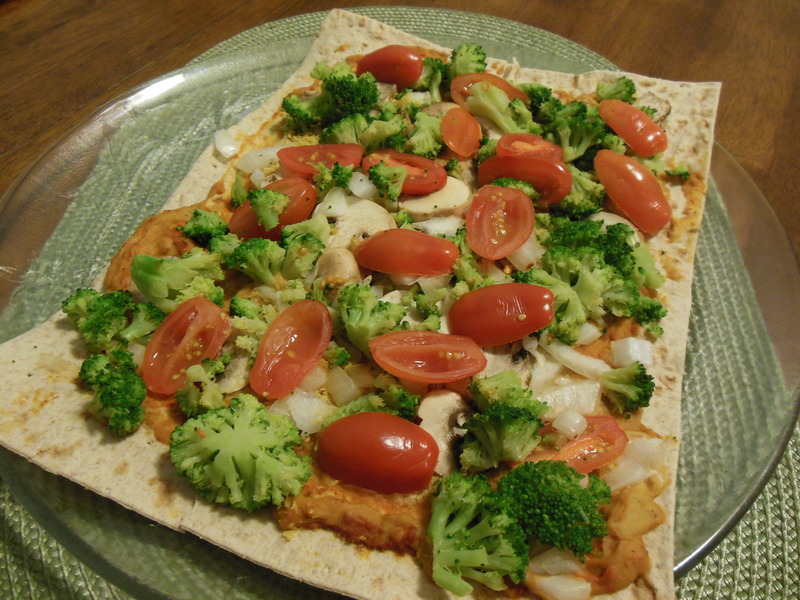 If you’re inclined, or have time to make your own pizza crust or pita bread and work with fresh veggies – go for it – but I like this version which is super quick and it’s totally nutritious. 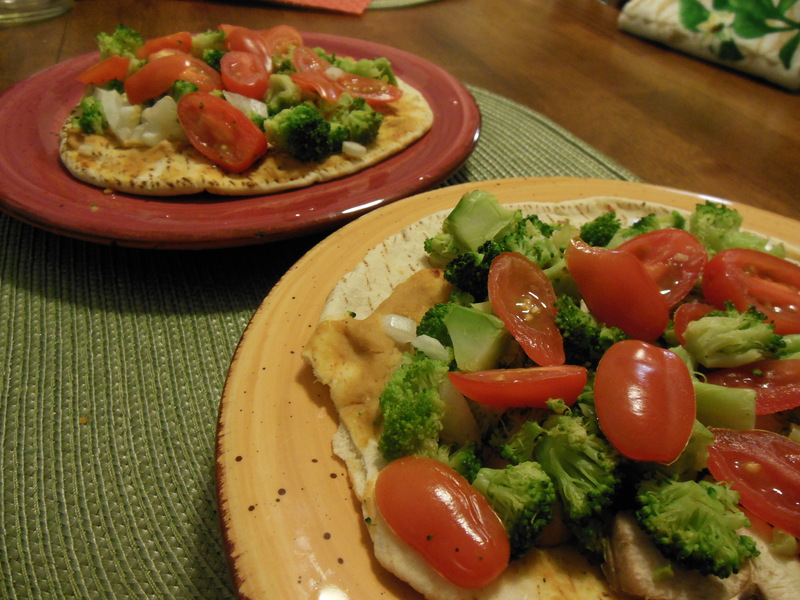 2 -100% whole grain pitas (check the ingredient list for how it’s sweetened, avoid corn syrup; and the type of oil used, stay clear of palm oil). I like one called Arabic Bread that I found at Market of Choice, reasonable price. Get all your veggies and ingredients prepped. Preheat the oven to 250°F. 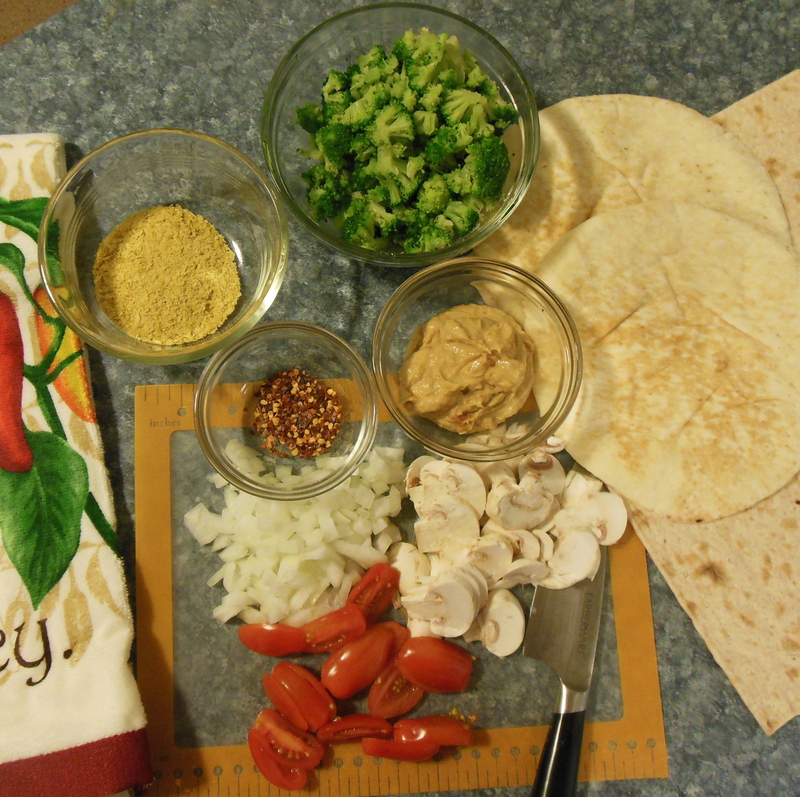 While the oven preheats, place the pitas side-by-side on a baking sheet or baking stone and warm for 5 to 7 minutes. Remove from the oven and spoon on the hummus. 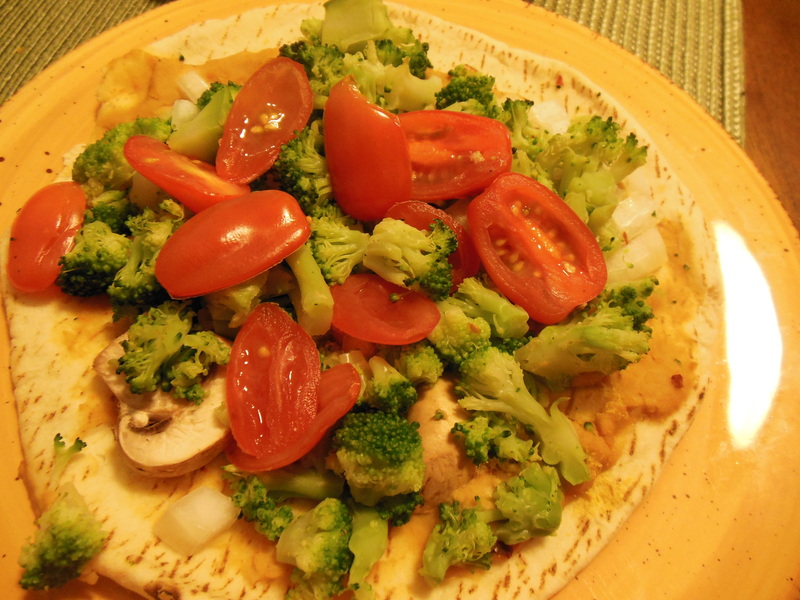 Sprinkle with Nutritional Yeast and pile on the mushrooms, onion, broccoli and tomatoes. You can’t have too many veggies! Bake for 30 minutes. We always like a little spice so we like to sprinkle red pepper flakes into our hummus or you can sprinkle a few on just before you eat. Your preference. Devour and enjoy! PS: Often times I make this on Lavish bread (I’ve picked this up at Trader Joe’s and Market of Choice. I add the all ingredients and bake it the same amount of time. I piece can be shared with two people. It’s also a great appetizer or finger food for a party. I like the fact that the bread comes out kind of crispy.